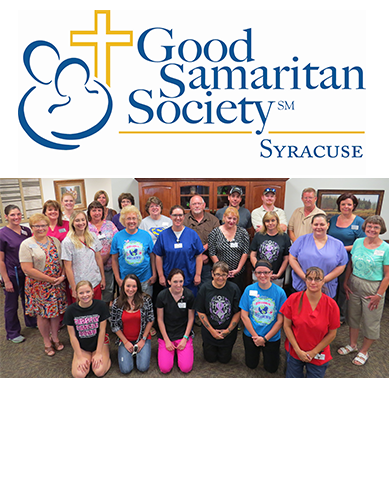 The Good Samaritan Society – Syracuse offers a variety of services for both short-term and long-term circumstances. GSS-Syracuse is a licensed skilled nursing facility with professional nursing staff 24 hours per day. All admissions are on a 24 hour / 7 day a week availability. Long-term skilled nursing care is available for those who are unable to live independently and require assistance in fulfilling daily living needs. A person centered care plan is prepared and regularly reviewed for each resident, ensuring each individual’s needs and desires are met. Short-term / Post-Acute Rehabilitation Services at the Good Samaritan Society are for people of all ages who no longer need hospital care, but would benefit from additional therapy and care before returning home following injury, illness or surgery. There are 7 Post-Acute Rehab Rooms available for these admissions. The rooms are furnished with bed, dresser, overstuffed recliner, flat screen TV, private bathroom and home like décor. Our Medicare-certified post-acute rehab programs feature therapy gyms and include physical, occupational and speech therapy. Other Services Offered: Inpatient / Outpatient Therapy, Home Health, Respite Care, Hospice, Adult Daycare, Specialized Care Plans for each resident. Our Mission: The mission of The Evangelical Lutheran Good Samaritan Society is to share God’s love in word and deed by providing shelter and supportive services to older persons and others in need, believing that “In Christ’s Love, Everyone Is Someone”. Business Hours: 8 a.m. – 4:30 p.m.
Visitation Hours: 7 a.m. – 9 p.m.